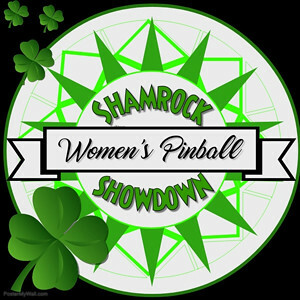 Come show off your pinball skills or LUCK at the Shamrock Showdown at Paz's Pinball Parlor on Saturday, March 16, 2019! Don't be left feeling green with envy should you miss this event. This is a 3 strikes event: Best-of-1 Matches (4 player matches – 3rd/4th place get strikes – 3 player groups ONLY 3rd place gets a strike). Groupings, play order and games will be randomly generated. Play continues each round until one player is left. Location: Carolyn and David Paz's home, Pembroke Pines, FL (address provided as we get closer to the event). Doors open at noon. Tournament play begins at 1 P.M. Awards for 1st through 4th place. Limited to 24 players due to space limitations. IFPA fees covered by host. Snacks and soft drinks provided. So cool to see more women getting into pinball and more events like this popping up in Florida! Good skill to the ladies Babee!!!! I sent a request, too, please. I am thrilled that Madison is coming back to the game! She's ready to take over! 3 weeks left and there are still a couple of spots left, ladies. well...you just don't know yet. it's well worth the drive. Thanks, bro, and you haven’t even been to the new Paz’s Pinball Parlor. i'm making assumptions off the old southwest-of-nowhere parlor (turn left at the goat, another 20 minutes...). where i dared not to touch TZ or Medieval...IIRC. chromed out masterpieces. i look forward to the new locale. My mom wants to jump in!